Muscular Movement: it's arguably the most essential skill of a good business penman. It is the engine that powers smooth, continuous, effortless writing. Although nearly every penmanship manual discusses it to a greater or lesser extent, I have found it surprisingly difficult to find a satisfying explanation of how and why the technique actually works. Muscular movement is a mechanism for writing consisting of two physical actions—a rolling motion of the upper arm from the shoulder, and a lateral motion of the forearm from the elbow—operating in combination, with the forearm resting on the desk, acting as a pivot. 1) Sit with your body parallel to the desk. 2) Rest both arms naturally on the desk so they form an approximate right angle with each other. 3) Keep both elbows off the edge of the desk. 4) Angle your paper slightly to the left—this will help with writing across the page and maintaining your slant. I will save the topic of pen-hold for another post! I will say, however, that the movement technique demonstrated here was intended to work with the "knuckles-up" pen-hold described in penmanship texts of the day. Ok, time to start writing! With the pen on the paper, let your forearm swing back and forth from the elbow. Because of the relative paper angle, the strokes produced will be at a shallow upward angle from the baseline. 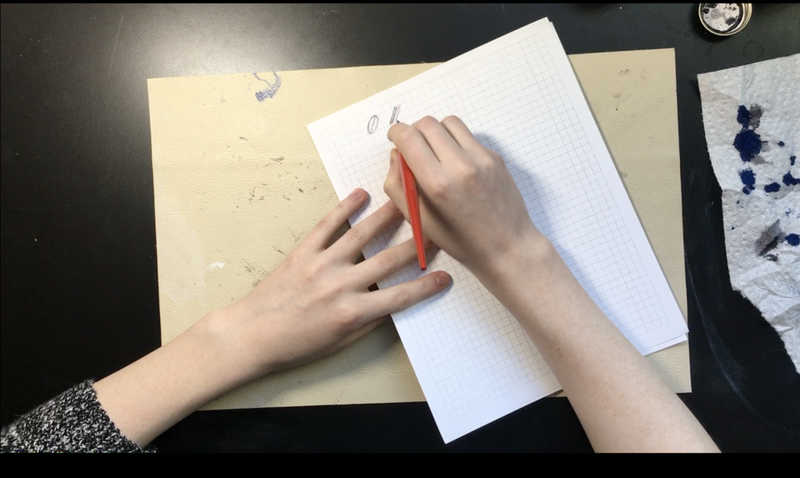 This is the lateral component of muscular movement that allows us to produce connective strokes and glide unencumbered across the page. Beginning again with the lateral forearm movement, make an upward curve from the baseline. As the angle of the curve increases, notice how the movement naturally transitions to a forward-back motion of the upper arm from the shoulder, while still retaining a slight extension/retraction of the elbow hinge. The very top portion of this curve lies along the writing slant. This is where the primary "engine" of muscular movement writing is engaged. In this zone, the upper arm is rocking forward and back, pivoting on the large muscle of the forearm. The rocking motion moves the pen straight up and down on the page while the elbow hinge provides just enough lateral motion to keep the pen tracing on the slant. This gesture is what we often refer to as the "push-pull." Notice that as I transition from the push-pull to an oval, the rocking of the upper arm very subtly expands to a rolling motion. I find it helpful to think of both the push-pull and oval as being of essentially the same movement. The seamless transition between the two gestures is what allows us to execute fluid business penmanship.